These are great! They have some kind of memory foam or something in them..? They feel great! My horse has a large wind puff on his front ankle that has never caused him any problems but I always feel like I need to give him extra support. These fit great without any weird bunching, stronge Velcro and plenty of support! I love them so much I ordered a second pair! I've schooled cross country through water and mud, I can just hose them off! The dirt and sand seem to brush off easily! Definitely recommend these! These boots are much thinner and seem to release heat and keep the horse's legs cooler much better than others. Still provides great support like a thicker boot. Rather pricey but so far seem worth it. I use them for my HS rodeo team roping horse. Fit very well. Love the color. Have used the old boots and these new ones for years. I only got a new pair because I liked the color. My other boots are the original SMB and they are still in excellent condition and work great after 15 yrs. this newer boot may not last as long as the boot itself is not as thick, but that has advantages as well. This new boot doesn't get as much dirt and sand and it fits better. I love the Elite boots for my horse and they last forever. I was looking for these boots for a long time. It was hard to find the size I needed in the color I wanted. My 2 year old paint horse has grown so much that i needed to find a large size for him. I was super excited to find this color sold by the pair and not the set of 4, although I would have bought the set of 4 if it was my only choice. Cute pattern, but are they better for the price? I loved the camo pattern from first ad that I saw, but as I own only one other pair of boots, I thought they all came in the same shape. Not so. These are quite different from the Classic Equine boots, which come with more protection at the fetlock. But my friend likes these Prof Choice SMB III boots better. Just a matter of opinion, I suppose. As other reviewers said, these are a bit trickier to apply. Gotta line up the inverted curve in front, and then wrap the bottom. The vertical edges only just meet each other, for the most part; very little overlap like the CE boots. Again, not sure if that matters to the horse. It usually takes me 2-3 tries to get it just right. Note: if I were to be working my horse more than casually, and given the steep price of these boots, I would have spent a few more dollars and gotten the Iconoclast boots. I didn't this time because I was -stupidly - hooked on the pattern vs white or black. I recommend them but with hesitation. These sport boots are amazing! They fit my two horses great and really help for support. I love the color choices and designs. These are the best sport boots out there for support and the designs are a bonus. Get this product! They use these at the barn I ride in. I've used these for years and they have never let me down! Great fit and excellent support for horses, I use them for polo a very demanding sport. Why don't you have the stane glass bell boots in the place where you pick to order the bell boots? BEST ANSWER: These are splint and fetlock protection boots, not bell boots. Unfortunately the stained glass style is not available, so it will not show as a choice on the drop down list where color is selected. Which boots are best to support a front leg ligament injury? 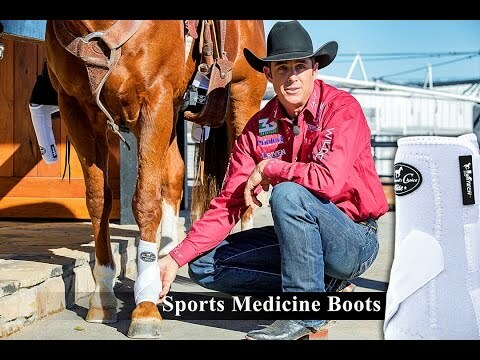 BEST ANSWER: Professionals Choice sport boots are one of our best sellers for tendon and ligament support. Please also check with your horse's veterinarian. My horse measures a little over 9.5'', which would fit better a small or medium? BEST ANSWER: Unfortunately it's not possible to guarantee fit in advance, but that said, if you have measured the widest part of your horse's fetlock joint at over 9.5", you "probably" want the medium. Professionals Choice recommends that the edges overlap 1/2" to 1 1/2". Please also take the boot height and the horse's height into consideration. Or, you might wish to consider ordering two sizes and plan to return what doesn't fit. Bear in mind you would be responsible for return shiopping costs if you go that route. I would always like them a little big rather than too small. I would do a medium. You can always tighten the Velcro and then they have a little more coverage. My horses are 14.3-15.1 hands and all wear medium. My horses are mares and are average built- not stocky and not thin. BEST ANSWER: The camo color is not available it is still showing the color on the website, but its not available. Why isn't the "Red Cross" color available in any sizes? BEST ANSWER: Unfortunately, the Red Cross pattern is not being manufactured at this time. Do you have medium in the stainglass pattern for the front legs? BEST ANSWER: I'm sorry, we do not currently have that pattern/size available. need pink camo splint boots do you have in stock? BEST ANSWER: Unfortunately not -- we have pink, and we have camo, but not pink camo. I have a horse with a tendon issue so the one leg is thicker than the other. I use the MED size for height he's about 15.1 but for the injured leg I could use a little more circumference. Should I order a LARGE for this reason?